The Home Energy Detective offers news and resources to help educate you about your home energy use. Why is it important to hire a home efficiency specialist? This video is a humorous look at how different professions have a solution for your problem. When all you have is a hammer everything looks like a nail. HVAC, insulation professionals and window representatives all want to sell you their products. 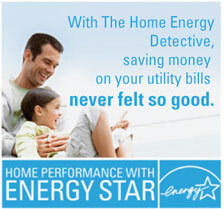 Contact the Home Energy Detective and Discover the Facts.